One of the things that we see in children in recent years is serious weakness in the shoulder belt, and contraction of the muscles, which are also caused by computer games and tablets. In the past children could raise their arms to make an arrow shape by their ears. A worrying phenomenon is that children can’t stretch their hands because their bodies are contracted and closed, which also affects the quality of breathing and posture. 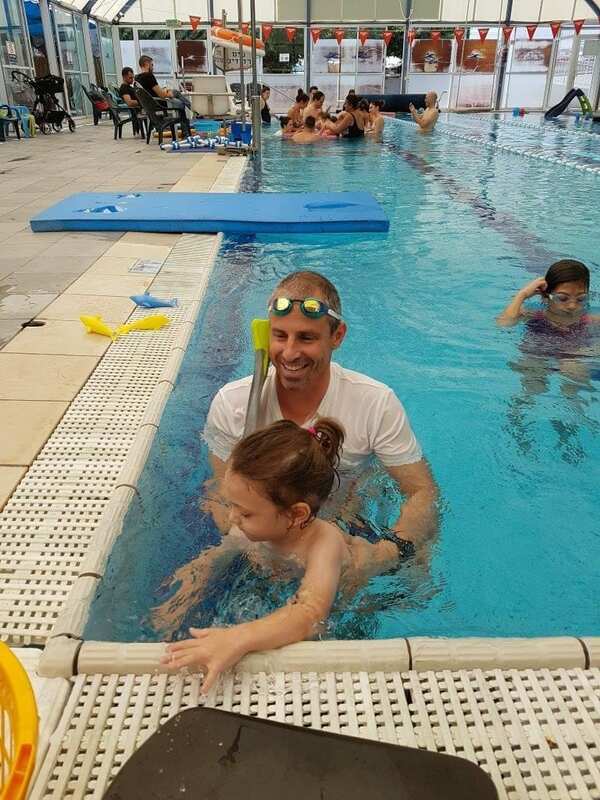 Shoulder strengthening exercises are important not only for swimming, but also for quality of life, breathing and posture improvement, so that the child will not be stooped, but instead will build up strength and self-confidence. The basis is strengthening the entire shoulder belt, deltoids, trapezius, arms, and the dorsal wide muscles. 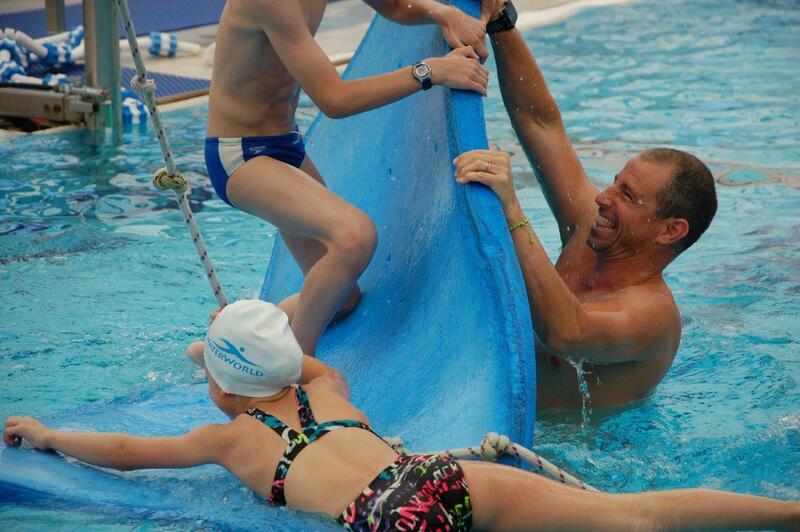 Basic shoulder belt exercises and exercises with fins will allow children to swim faster and easier, and enjoy strengthening outside the water. One of the best exercises for toddler swimming. How to perform the exercise: The banana is closed tightly with a single hoop or ring or several hoops. The child holds the hoop and kicks with / without fins. Level of difficulty: After practicing close to us, allow the child to turn around and move independently. Strengthens the shoulder belt and also the core muscles. Do not switch to an open banana and an arrow until this exercise is performed well. 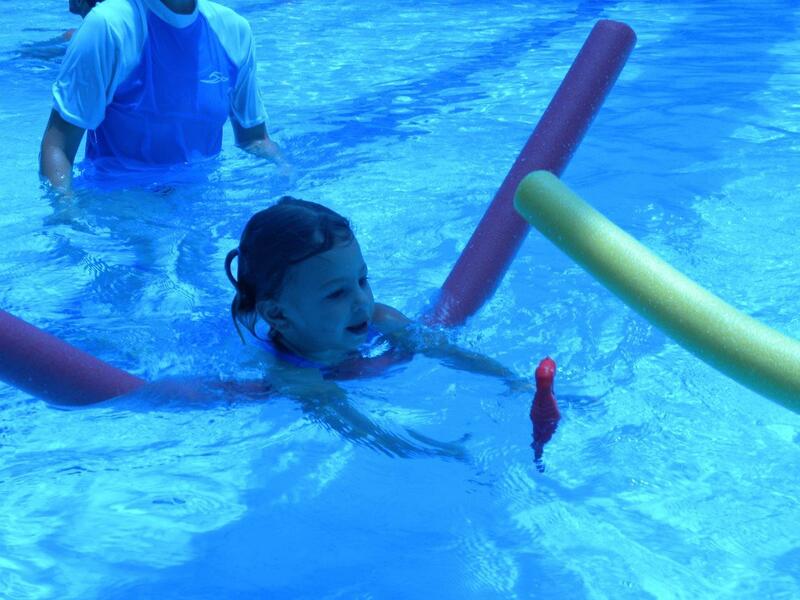 Goals: Holding the hoop requires the child to use the shoulder belt rigorously, the banana that rises upward keeps his mouth and nose away from the water, and the child kicks while the body is in a swimming position. 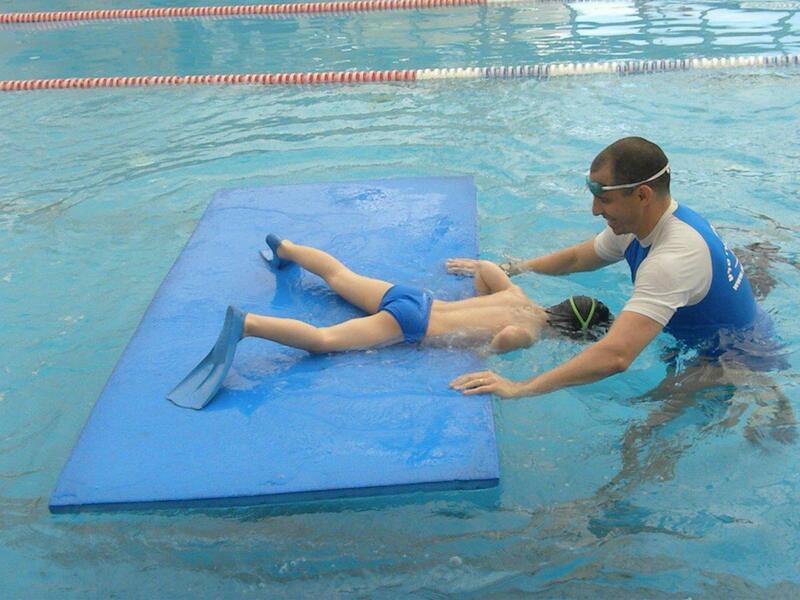 Using fins will increase the elasticity of the foot. How to perform the exercise: The exercise is performed with the hands in an arrow, thumbs over the water. The child, by kicking the legs, has to reach and grab objects. If the child is weak in the shoulders, the arrow will sink, the elbows will be bent, and the mouth will touch the water. We will practice until the thumbs stay above the surface of the water, and will not sink. 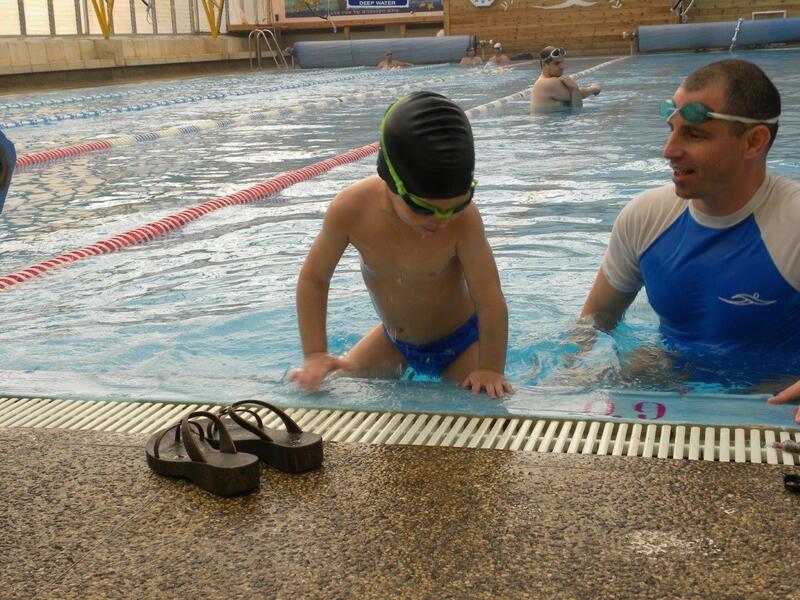 Goals: stability, swimming position, shoulder belt strengthening, development of elasticity in the foot. 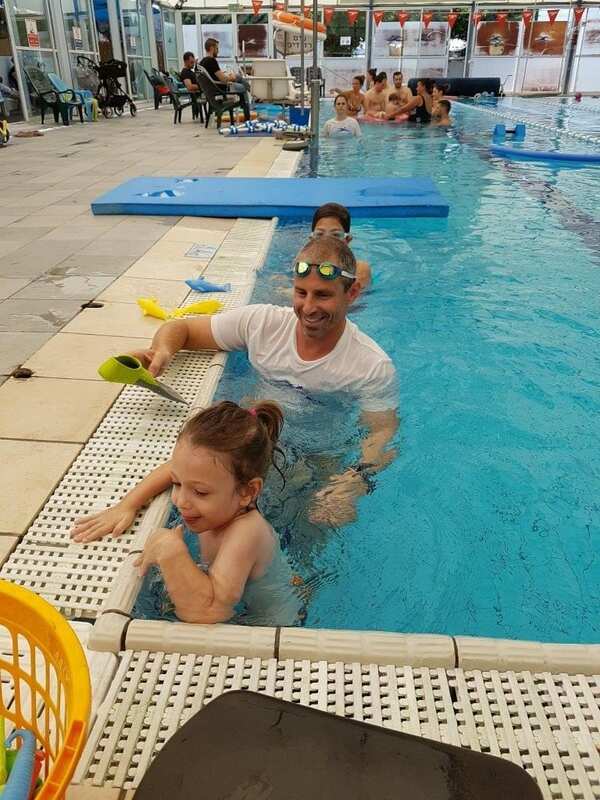 How to perform the exercise: Hold the child, progressing with the hands holding the side of the pool, shoulders sticking out over the water line. Walk in one direction, and then back. If the child has difficulty, adjust the speed of performance and practice with the child according to his abilities (abdominal muscles, arms). Level of difficulty: After the child managed to perform with assistance, instruct him not to leave the wall and let him perform independently, in both directions. Goals: To encourage confidence in the child that he can hold the wall only with his hands, without his legs, and not leave. Strengthening the shoulder belt and core in preparation for lifting above the water. 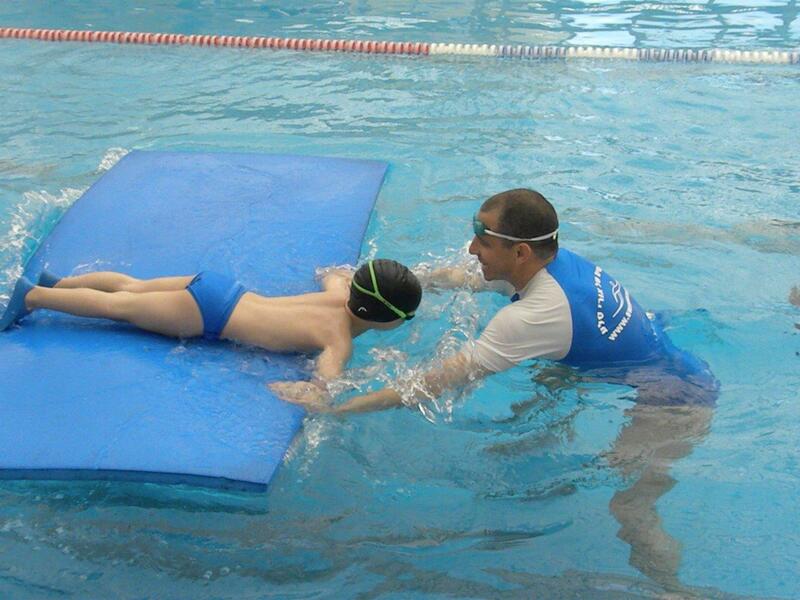 A child who’s weak in the shoulder belt will not be able to rise above the water to breathe while swimming. 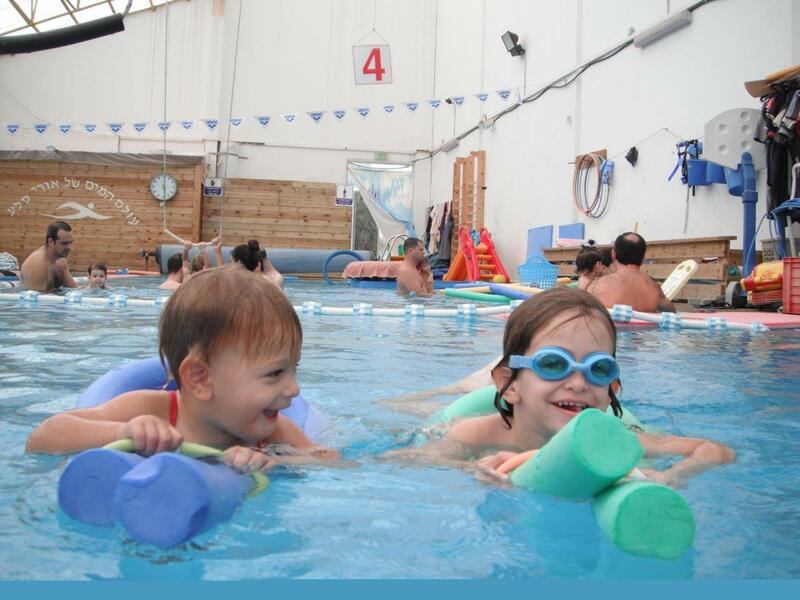 An excellent exercise for keeping the group busy while practicing swimming with a single child, and in this way the whole group works throughout the lesson. How to perform the exercise: Hands holding the pool wall, legs leaning against the wall with a slight bend or perfectly straight, and a rapid progress. You can challenge with objects on one side that the child will return to the other side. Practice for both sides (5 meters in each direction). Goals: Develops self-confidence, strengthens the shoulder belt and posture. This way we can perform more difficult exercises later on, and we can also keep children safe while the instructor is not around. 5. Climbing the wall – elbows on the wall in 90 degrees. Make sure that the child has managed to walk independently on the wall as in the previous exercises, otherwise he will not be able to climb. 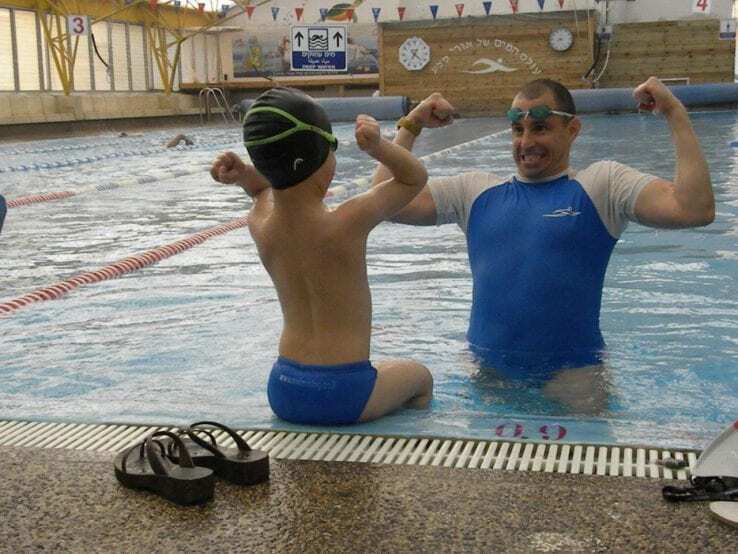 How to perform the exercise: Put one hand 20-30 cm in front, elbow on the edge of the pool, leaning on the other hand, and guide the child to rise up. The child works hard with the back muscle in the arm and with dorsal wide muscles. After he has raised half the body on the side of the pool, we will teach him to bring forward a bent knee and lean his stomach on the floor (if required), and then climb up to sit on the side of the pool, put the hands in an arrow, jump back in and repeat the exercise.. Difficulty: The exercise is difficult to perform. Supporting the legs and guidance will help. Goals: Strengthening the shoulder belt. The back hand works very hard and that will strengthen the elbow. Strengthens the upper body (Deltoid, Trapezius) and will assist in lifting the body above the water while swimming and lifting the head for breathing. Gives the child independence in climbing and jumping. 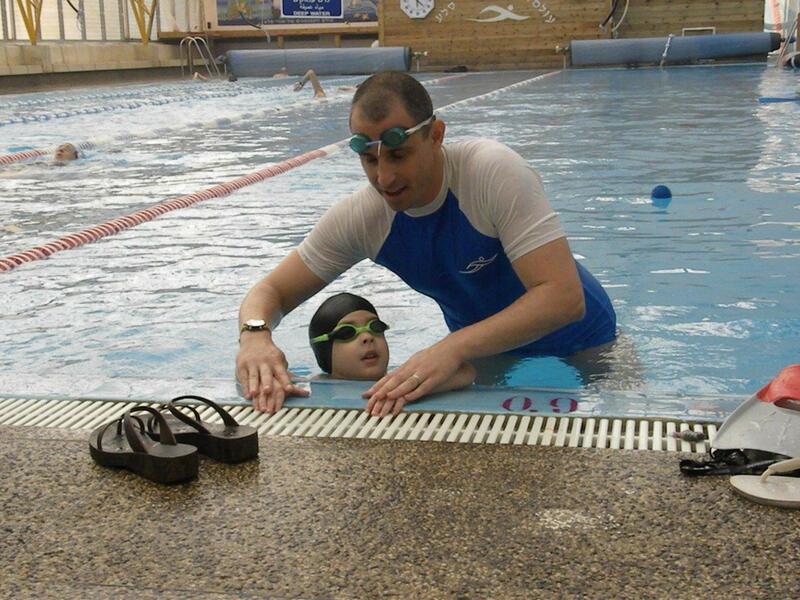 How to perform exercise: The child locks elbows and the instructor supports the legs. The deltoids and the core muscles work very hard. Level of difficulty: The more the hands are bent, the more muscle groups are recruited. We will make sure the hands are straight to prevent the work of additional muscle groups, and focus on the deltoids and core muscles. Goals: Strengthening the torso, strengthening the shoulder belt. How to perform the exercise: Hands holding the pool wall, feet leaning against the wall with a slight bend or perfectly straight. The child climbs and sits on the side of the pool, makes an arrow and jumps back in. Praise the child for every successful climb. Level of difficulty: Fast climbing encourages assertiveness. Goals: Strengthening the torso, strengthening the shoulder belt, developing muscle groups to work together to raise the head above the water for breathing. 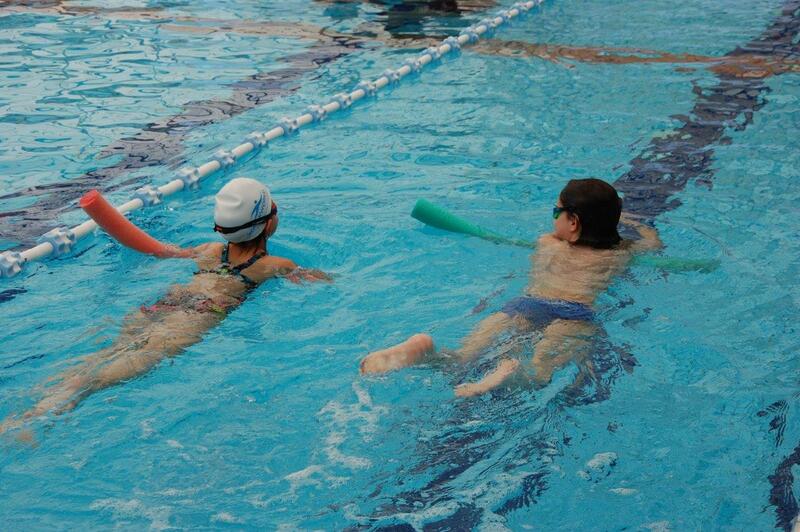 How to perform the exercise: Straight hands, banana under the waist, kicks with fins for short distances. The child comes to us, we stretch him gently, and he swims back. The dumbbell keeps the hands up and does not allow the arrow to sink. Goals: Head lift and breathing timing. It is important to see that the child can move forward with his head out of the water before practicing blowing bubbles. It is more difficult to keep the head outside than inside. 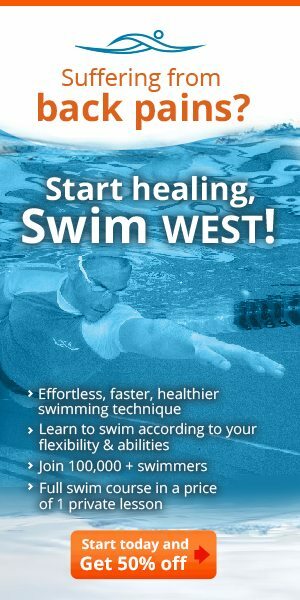 The shoulder belt is constantly working, and the fin requires the body to lengthen – the “base of the base” of shoulder belt work, progress in water, and the creation of a flow line in swimming. How to perform the exercise: Stretched hands holding the dumbbell, kicks with fins for short distances. The child comes to us, we stretch him gently, and he swims back. The dumbbell keeps the hands up. Goals: To see that the child knows how to hold the dumbbell, to build confidence in the child. How to perform the exercise: Stretched hands holding the dumbbell, kicks with fins, head in water. Count 1-2-3 above the child, then the head rises to inhale. Make sure that the child lifts the head slowly and inhales without sinking the hands / dumbbell (which floats the arrow and strengthens the shoulder belt). Goals: Allow regulation of inhalation and exhalation while holding the head in the water 3 seconds. How to perform the exercise: Stretched hands holding the dumbbell, hands touching each other or at a small distance, gently rotating the dumbbell forward all the time (as if wringing a garment), kicks with fins, head in water, counting 1-2-3 above the child, kicking, inhaling. Level of difficulty: It is also possible to rotate the dumbbell backward, working on the pectorals strongly. Goals: Strengthening the shoulders belt and working on the small muscles, and the fine and coarse motor skills of the forearm and arm (many children dislocate and sprain the elbow). Will allow further on for the head to lift for breathing without the dumbbell. How to perform the exercise: Stretched hands holding the dumbbell, kicks with fins, head in water, counting 1-2-3 above the child, head rising, child continues to kick with the legs, the child turns the left side of the dumbbell, changes the grip on the dumbbell, and returns the head to the water. Goals: Beyond strengthening the shoulder belt, the child will lift up and work with all the core muscles, the abdominals, strengthen the leg muscles, learn to work with changing angles. Changing the grip takes the whole body to a 45 degree angle .The child will extend the body, and raise the head to breathe in a much easier and slower way. The combination of several muscle groups will also allow a weaker child to lift his head in a slow and easy way. 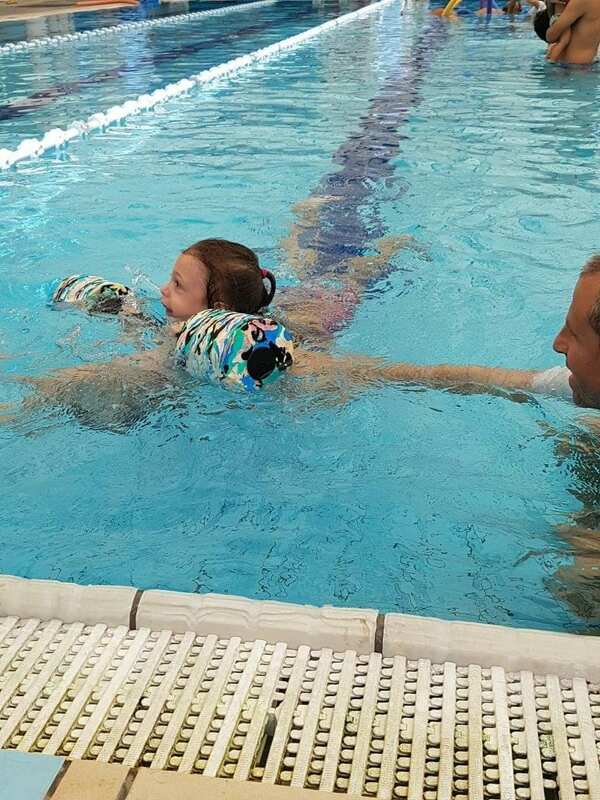 How to perform the exercise: Stretched hands holding 2 balls, elbows locked, kicks with fins, head in water, counting 1-2-3 above the child, all the time the child rolls the balls forward, non-stop, trying not to separate the balls from each other. The head rises, not high, should be precise, continues to kick with the legs. It is very difficult to continue rotating the balls when the head is up. It is important to be precise with the height of the head. Goals: Strengthening the shoulder belt, coordination and motor skills of the muscle groups that the child will use when grasping water with his palms when he does not have the ball or floating dumbbell. Another goal is to play while strengthening. How to perform the exercise: hands in an arrow, right hand stretched, left hand half-fisted, holding a ball, kicking with fins all the time. The child makes a circle with his hands, raises his head, closes back to the arrow and passes the ball to the right hand, which becomes fisted, and the left hand stretches. Goals: To put an interest in shoulder-strengthening exercises, to work on the coordination of a fisted hand and a stretched hand, a coordination that will help with the slow and orderly circle making with the hands. SAFETY: The instructor will always be with his the back to the wall, between the mattress and the wall. Make sure after each exercise that we have not moved. Never drop a child who can’t swim into the water! How to perform the exercise: The child holds the edge of the mattress. The instructor asks if he is ready, and shakes the mattress. The child holds tight, clenching his muscles, even the elbow, to form a strong enough grip. Children who are not strong enough will grab the other end of the mattress with the fin and lock their legs. Be careful to shake according to the child’s strength so as not to make him fall into the water, but so that he will experience success. 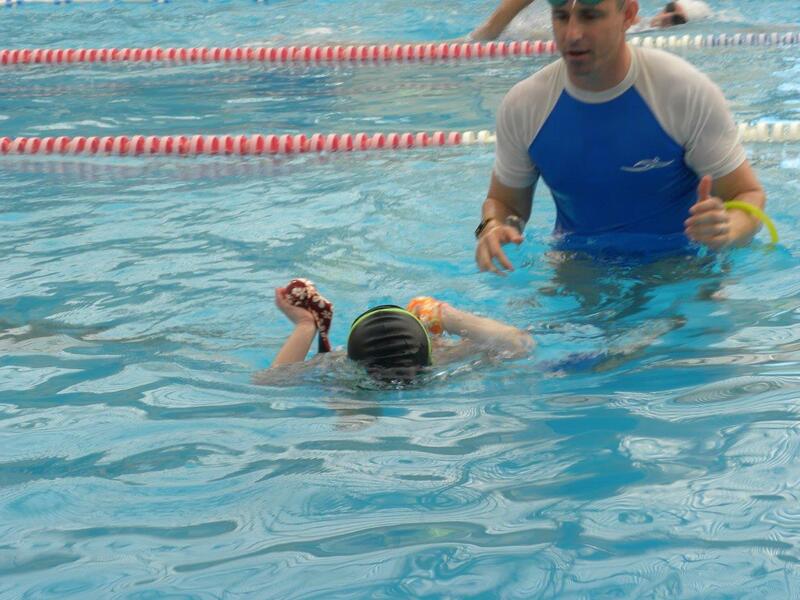 At the end of the exercise, use enough force that will cause the child to fall into the water, forcing the child to contract a lot of muscles, the shoulder belt, and to hold the head above water during the shaking. 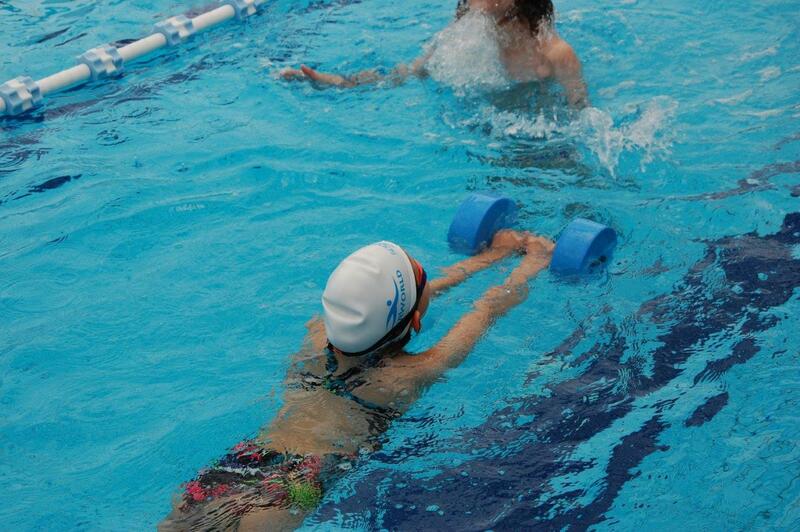 Goals: Strengthening the shoulders while playing, strengthening holding of the head above the water. Recruits the whole body at once, which locks, in order not to fall. Note that there are children who do not like this exercise. How to perform the exercise: The children hold the edge of the mattress. The instructor lifts the mattress from the direction of the face. Shake and raise slowly, take a peek and make sure everyone is holding tight. Drop at once and make sure nobody flies forward. The children are challenged not to fall. Goals: Strengthens all flow line, core muscles, shoulders, legs. This is a game that the kids love – keep it as a treat for the end of the lesson. How to perform the exercise: The children keep their feet on the mattress, hands folded, face in the water, making bubbles, holding tight to the edge of the mattress, and raising their heads to breathe. The instructor lifts the mattress from the direction of the legs, and peeks over to make sure everything is fine. 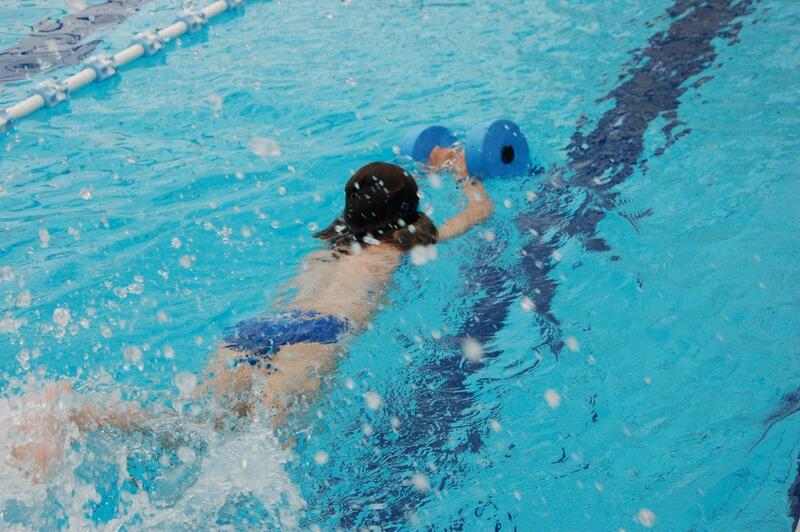 Objectives: Footwork and core muscles in order to better lift the head and body above the water. Playing while strengthening. How to perform the exercise: The children climbing the mattress (not at the tip of the mattress), maintaining stability (instructor lending a helping hand), and jumping to the water. Difficulty level: Children who have difficulty climbing the mattress (the same children who had difficulty climbing the pool side) will put their hands in the shape of a triangle, bent elbows, palms touching, and lean on their stomach. How to perform the exercise: Stretched hands grasping a large dumbbell, kicks with fins, head in water, counting 1-2-3 above the child, head rising, continuing to kick with the legs, raising one side of the dumbbell, and returning the head to the water. Level of difficulty: Performing the exercise in pairs, facing each other, simultaneously raising the heads, one leaning and forming an anchor for the other, and the other raises one side of the dumbbell. Goals: This is a hard exercise, strengthening shoulder belt, core muscles. Helps in lifting upper torso. How to perform the exercise: One hand holds the banana for floating, kicks with fins to the eggs scattered in the pool, reaching out with the other hand held straight, kicking feet to location of the container and placing the egg in the container. Repeat after switching hands. Goals: Working on coordination, while making progress, strengthens the weak hand. A fun game that brings interest to the practice.